Welcome to my website dedicated to Minami Kotaro's adventure as both Kamen Rider Black and RX. 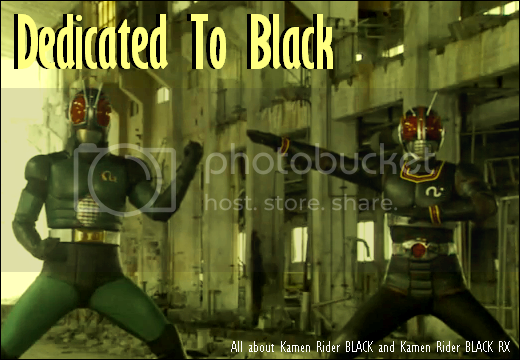 Kamen Rider Black started on October 4, 1987 and ended on October 9, 1988 with a total of 51 episodes. Kamen Rider Black was the 8th Kamen Rider series created by the late Ishinomori Shoutarou. I'll say its my favourite Kamen Rider series of all time. The next Kamen Rider series was introduced and started airing just two weeks after Kamen Rider Black ended. But instead of introducing a totally new Kamen Rider, they actually took Kamen Rider Black and changed him for this next series. And from there, the Minami Kotaro saga continues and this time, he's up against a new evil force as Kamen Rider Black RX. Dedicated To Black first went online on Saturday, May 8, 2004.